Manufacturer & Exporter of Stainless Steel 316Ti Round Bars & UNS S31635 Round Rods, SS 316Ti Bright Bars, Steel 316Ti Rods, 316Ti Hexagonal Bar Suppliers in India. 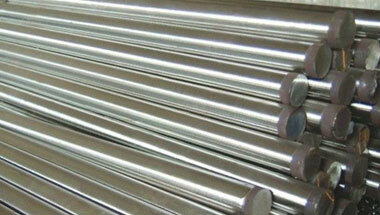 We are manufacturer & exporters of a vast range of SS 316Ti Round Bar. It is available in various sizes, shapes, dimensions and finishes. All our items can resist high pressure and temperature applications and require less maintenance. Our entire range is developed exclusively by making use of global class raw material and current technologies. Grade 316 is the standard molybdenum-bearing grade, second in importance to 304 amongst the austenitic stainless steels. The molybdenum gives 316 better overall corrosion resistant properties than Grade 304, particularly higher resistance to pitting and crevice corrosion in chloride environments. It has excellent forming and welding characteristics. This 316TI SS Round Bar is highly recommended amongst the customers for their effective usage in various places. Our product is available in reliable in nature, robust in construction and known for their long functional life. All our offered range of products has been made using the best technology. Besides these, customers can avail this Table Saw from us at affordable rates. Stainless Steel 316Ti Round Rods Manufacturer, SS 316Ti Forged Bar, Steel 316Ti Hex Bar, Stainless 316Ti Hollow Bar, WNR 1.4571 Black Bars Supplier in India. Malaysia, Algeria, Democratic Republic of the Congo, Uganda, Morocco, United States, Italy, UK, UAE, Houston, Israel, Cameroon, Sri Lanka, Bahrain, Germany, Dubai, Kuwait, Iran, Trinidad and Tobago, Azerbaijan, Mozambique, Peru, Tunisia, Africa, Sudan, Jordan, Egypt, Kazakhstan, Canada, Brazil, Iraq, Russia, Colombia, Argentina, New Zealand, Ethiopa, Nigeria, Thailand (Bangkok), London, Mexico, Indonesia, Vietnam, Australia, Angola, Ghana, Turkey, South Africa, Venezuela, Saudi Arabia, Chine. Durban, Casablanca, Freetown, Maiduguri, Aqaba, Pretoria, Zaria, Doha, Nairobi, Subra al-Haymah, Douala, Riyadh, Amman, Dubai, Lusaka, Cairo, Kinshasa, Kano, Lagos, Hong Kong, Lubumbashi, Byblos, Colombo, Muscat, Luanda, Kolwezi, Abu Dhabi, Omdurman, Maputo, Ibadan, Antananarivo, Jeddah, Bethlehem, Fez, Istanbul, Kampala, Mecca, Abidjan, Manama, Data from the UN, Brazzaville, Dammam, Johannesburg, Tehran, Cairo, Cape Town, Tripoli, Kaduna, Harare, Port Elizabeth, Alexandria, Soweto, Conakry, Ouagadougou, Mogadishu, Singapore, Beirut, Sharm el-Sheikh, Addis Ababa, Algiers, Dar es Salaam, Jerusalem, Benin, Giza, Accra, Mbuji-Mayi, Bamako, Dakar, Khartoum, Yaoundé, Bulawayo, Tel Aviv, New York, Rabat, Port Harcourt.